I tried to update the software on my mobile phone, a Sony Ericsson w800i. There's a handy tool for that, called Update Service, that you can download from Sony Ericson. I like that you can do that yourself - without having to go to the phone resellers (and even have to pay for it). Of course the update software didn't work. I would have been surprised if it did, actually. My experience is that companies like this do not care about customer software. If they did we would not have projects like floAt's Mobile Agent. Exactly the same goes for many other tech companies, like Philips and Creative. When trying to run the update, I got this window. 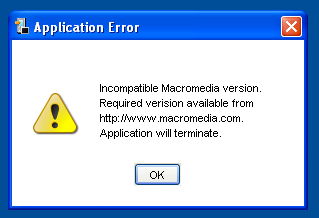 Of course I updated my Macromedia software. Who knows what version it expects... why it (at all) required Macromedia to flash the phone bios I don't understand. It turns out that Internet Explorer needs the latest version of the Flash plug-in - not something a Firefox user really cares about. Ok, so that is now done and it is working. Content updated 10 March 2019. <URL: http://www.boralv.se/blog/?id=1148039314>. This server is able to calculate 20.6 pages like this per second. No computers were harmed in the making of this page. CSS Validator, HTML Validator.